It's best to put all that technical talk in perspective and see how it all comes together in a proper ski turn. Some of the basic technique elements include short/long legs, edging, platform and pressure, counter and counterbalancing, timing etc. 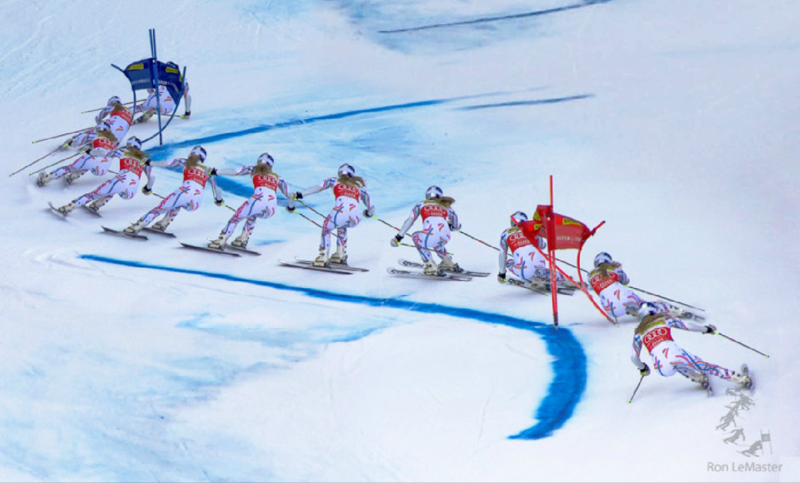 I find that many points of ski technique are misunderstood and trigger massive discussions, while the finer or more advanced technique elements of Giant Slalom turns are usually never documented but tend to be the stuff of legend and great debates. First, starting with the first frames in the direction of travel, finishing off the turn, using the tails to accelerate and get power out of the turn, initially letting the skis accelerate forward. This is a great finish, as the skis are floating towards the next turn, in frame 4. However, at skis flat, she is not really back on the skis, as you can clearly see the forward angle of the shins - the skis are pulled back well under the hips, to the extent to which the boots allow it, preparing for the next turn. Oh man, the ankles on that skier, eh? The turn ends with a strong retraction of the feet and skis, from frame 2 to 4 the outside leg becomes short and the skis are floating. You will not see many high level skiers extending to release, with both legs long in the transition! Extension "up" is just how we get beginners to explore their range of motion, time their movements and get a feel of getting forward. There may be some situations where extensions are a good thing, but we're discussing the average turn here. As you can see, starting with frame 5 she is extending the outside leg, but she is not popping "up" but "in", while she is already forward. From the retraction release, she is low in the transition, with both legs flexed. This allows her to quickly move early into the new turn and establish high angles early. Long legs do not allow for mobility! See Sitting on a toilet. Looking at skis flat, in frame 4, we can clearly see her starting to get forward and move the body down the slope, crossing the skis. In frames 5, 6 and 7, she continues to move the body down the slope while extending to maintain contact with the snow. However, she is also establishing early pressure on the tips of the skis, by pulling them back under the hips in frame 4 and extending the body down and forward (or the leg up and back)... I sometimes refer to this as "upside down" as you essentially have the skis uphill from the body. Coiling is what helps keep the skis dig in and start carving way above the fall line in the photo above - see the "finer" techniques later. Some refer to this as the feeling of "falling down the slope" or "keep the body moving down the hill" etc. Just after skis flat, in frame 5, she has already established a platform on the new outside ski, without any pressure. An edged ski turns already - it doesn't take much pressure/weight to de-camber it. You can see that pressure only comes in frames 8-9 and until then the ski simply rides that edge without much pressure. She just maintains snow contact to have a platform and establish balance, while keeping the body moving down the slope and forward. Pressure comes on hard at the rise line, i.e. above the gate. The outside ski is bent now and turning hard while the inside ski has no real weight, so she's using the outside ski only: this ensures all the weight is on the outside ski, which consequently bends into a tighter radius. The inside leg shortens and the separation between boots increases with the angles, to avoid boot out and leave enough range of movement. She is consistently very compact at the gate, touching the gate with the back of the shoulders, while the hands are driving forward. At the gate, the skis are already pointing to the next gate and are releasing the turn. The turn is over... You can see that in frame 2 and see how the skis turn only minimally up to frame 3, as they are released. The amount of counter at the gate is decent: follow frame 1, where the hips are pretty square to the skis, in the fall line, to frame 2 at the gate, where the hips are still but the skis turned significantly, to frame 3, existing the turn with significant counter at the hips! Counter is developed by counteracting and coiling and is a very important element of high performance skiing - we should get into that subject some time. You can see that she does not incline the body into the turn, but instead I see a lot of separation and angulation at the hips, for a very dynamic and aggressive balance. The stance is definitely narrow. Which is as usually quite irrelevant in tech skiing, since her skis are "floating" through the transition. However, you can clearly see how this narrow stance allows her to establish the new platform very quickly and very early and in frame 5 she is already well inside the turn, with both skis well outside from under the body. If you look carefully at frame 4 - that's what a "hip width" stance is. Indeed, It stands for the natural comfortable stance, with the legs under the hips, see How wide is hip width. I don't know if the pole plant is missing - the hands seem to move properly but I don't see the basket swinging... perhaps that frame is missing. What do you see? Leave a comment below! Viewed 26612 times ( | Print ) this page. "In frames 5, 6 and 7, she continues to move the body down the slope while extending to maintain contact with the snow." I assume this extension is passive rather than an active 'looking for grip/pressure' extension? "However, she is also establishing early pressure on the tips of the skis"
Interested how this fits with Harald's articles on this: http://harbskisysems.blogspot.com/2019/01/early-pressure-in-skiing-big-fallacy.html http://harbskisysems.blogspot.com/2018/10/continued-clarification-of-technical.html Thanks! Well spotted - this is an older article and some of the descriptions could be revised, but it fits well with those articles. In fact, that "tech talk" linked to there, on early pressure quotes those articles and explains all these in more detail. Yes, her extension is "passive" and we can see that because the skis are not bending or turning - they're still going "out".